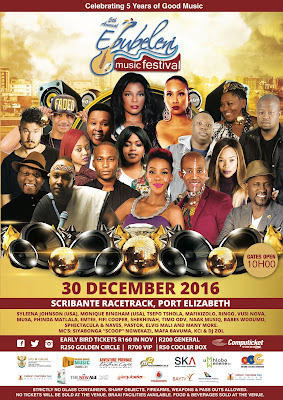 The much awaited 5th Annual Ebubeleni Music festival promises to be the biggest ever music concert in Port Elizabeth by far. New and a bigger venue with very user-friendly facilities. “Aldo Scribante Racetrack is this year’s venue. We have been looking for Ebubeleni’s home for the past 4 years and Scribante Racetrack just seems to be what we have been looking for, - plenty of safe parking, massive revellers’ space to picnic and dance...” said Marc Mahambehlala, Project Manager of Ebubeleni Music Festival. The event will be held at Scribante Racetrack on the 30th of December, the last [Friday]weekend of 2016. The growth of this festival has seen its support by revellers, primarily and initially from the Nelson Mandela Bay Metro increase to a national event status seeing revellers from all over the country’s nine provinces trek down to Port Elizabeth to enjoy the festival. What has marked this event’s uniqueness from the other motley of music festivals around the country is its family orientated theme, where people bring their picnic baskets, cooler boxes, camp chairs etc. Another insistence of the organisers is all inclusiveness of the event wherein all genres across all races are accommodated in terms of performing artists thus embracing the spirit of togetherness and social cohesion. DJ’s: SPHEctacula & Naves and Port Elizabeth Born stars, Vusi Nova, Phinda Matlala and NaakMusiQ supported by the very best of Nelson Mandela Bay’s local artists. Tickets are still very reasonable although the line up is so beefed up, in November only, there is a special for one to see their favourite artists with an Early Bird ticket at R160 for general access, from December it is back to R200 for a general ticket, R250 for Golden Circle, R700 for VIP and R50 for Cooler Box Tickets. Tickets can be purchased from Computicket, Shoprite, Checkers and House & Home stores nationwide. Revellers must please make sure that they purchase all their tickets before the event including the Cooler Box Ticket, because strictly no tickets will be sold at the gate. Gates at Scribante Racetrack will open at 10:00am and the festival starts from 12:00 until late.